Thomas and I were engaged! A beautiful and joyous time, but the question was: How could two active missionaries, living a world away from their home, plan or even afford a wedding? Neither of us had savings accounts or families that could foot the bill. Since we had chosen to get married in Louisiana near our FMC family, both of our families would need to fly and drive in from all over the States, so we wanted to have a reception for them to enjoy. We knew God brought us together and was calling us to get married, we just were not sure how we could make it happen with our lack of means. Shortly after we got engaged, while we were serving together in Asia, we went on a retreat. It was through my silent prayer time on retreat that the Lord showed me how our wedding would happen – He wanted us to change our way of thinking totally; He wanted us to view our wedding as His day and to have radical trust that, as our Father in Heaven, He would provide for our every need for the wedding. After I shared this with Thomas, we were both excited for our new outlook: surrendering the day to the Lord and trusting in His providence. As time went on and we prayed more about it, we felt the Lord wanted our wedding to be a real community event, that it would be our FMC community, our family and friends who God was going to use to bring His plans about. We also felt the Lord encouraging us to not hold back with the guest list – it was His day and He wanted all His children there. Reading Exodus 35, we felt God urging us to fundraise for our wedding. “Moses told the whole Israelite community, ‘This is what the Lord has commanded: Take up among you a collection for the Lord. Everyone, as his heart prompts him, shall bring…a contribution to the Lord.’” (v.4-5b). Not particularly excited about the idea of fundraising for our wedding, but convicted that it was God’s will, we sent out letters asking for support. And praise the Lord, people responded generously! With help from our parents, a small budget was coming together. But still it felt like mountains were in front of us: finding a caterer who would not charge us catering prices, finding a wedding dress I could borrow and like, a free wedding venue, flowers, wedding cake, a photographer who would not cost our whole budget. All of these felt like large mountains, and having never planned a wedding, we had no idea where to begin. Staying close to the Lord in prayer, we clung to Matthew 6: “Therefore I tell you, do not worry about your life, what you will eat or drink, or about your body, what you will wear. Is not life more than food and the body more than clothing?…Your heavenly Father knows that you need them all. But seek first the kingdom of God and His righteousness, and all these things will be given you besides.” (v. 25,32-33). This was our reminder of the truth that God is our Father and He will provide for all our needs: This is His day after all. So as Thomas and I let go of control and our own plans, we watched God move mountains. The mountains began to melt before us as He provided: my sister Teresa helped us from start to finish planning all of the little details; our friend and fellow missionary Alicia said the Lord put it on her heart to cater our wedding as her gift to us; God provided our community retreat house as our wedding venue; our friend and fellow missionary Danielle lent me her gorgeous wedding dress and offered to arrange the bridal party’s flower arrangements; another friend and fellow missionary Bridget offered to make our wedding cake as her gift to us. Another mountain that was important to me was the photography. Thomas called our friend to see if he could just photograph a part of the wedding, but he said the Lord had put it on his heart months ago to photograph our wedding, so he offered to photograph the whole wedding as his gift to us! A professional photographer offering his services as a gift, we were blown away by the Lord’s providence! In each of these instances, we rejoiced as God remained faithful to His promise as our Father to take care of our needs. Exodus 35 was coming alive as, “everyone as his heart suggested and his spirit prompted, brought a contribution to the Lord.” And the Lord was not just giving us second best, but providing His best for us. Incredibly, that list is not the end of how God provided, He continued to provide in large and small ways: from our friends the Spizales getting married a week before at the same location and sharing their flowers and decorations with us, to our friends the Romeros buying all the wine for our wedding reception as their gift to us. The list goes on and on. There was not a detail God left unnoticed. At the last moment God still had crazy gifts to pour on us. At our rehearsal at the church on Friday, David – a videographer for the diocese – was there setting up his many video cameras to record that evening’s mass with the bishop for the 100th year celebration of the Diocese of Lafayette. He offered, instead of taking down all his equipment the next day, to videotape our wedding. We were blown away! We could never dream of something so perfect but The Lord had it all planned out for us! When the wedding day April 14th came, it was a joyous celebration. And as Fr. Michael Richard reminded us in his homily, this was not our day but God’s day. And God was truly glorified that day. Thomas and I celebrated the most incredible mass of our lives and marveled at all that God had brought together. The ceremony truly was the most beautiful part. God did not stop with our wedding. He also provided lavishly for our honeymoon. Thomas’s dream was to go to Ireland. I thought he was crazy, but I supported him because I like crazy. So we prayed, told the Lord our desires and He provided through gifts for us to go to not only Ireland but also Italy for a papal newlywed blessing! 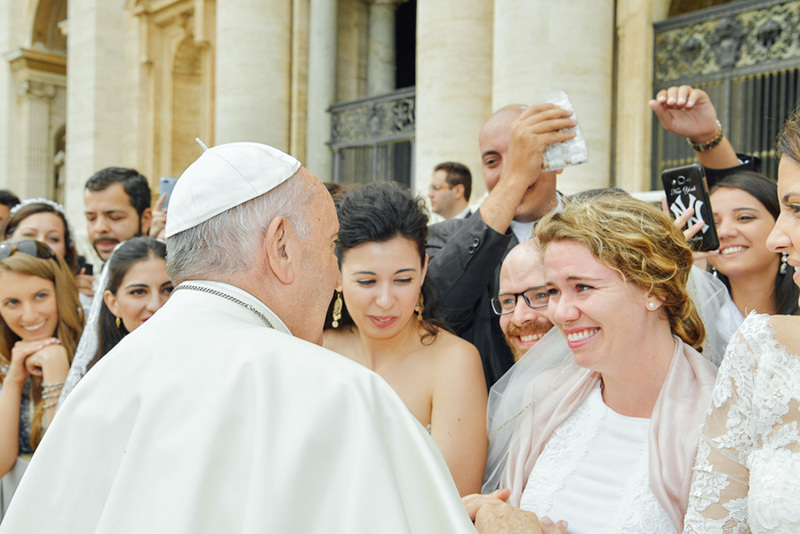 Our honeymoon culminated in meeting Pope Francis and receiving his papal blessing. As he came to greet us he held Thomas and I’s hand together and I was so overcome with emotion I could only muster enough words to share the gift we bought him, a zucchetto. Pope Francis put it on as he playfully adjusted it around his head. Our Holy Father’s presence was so loving I knew we were encountering Jesus Christ in that moment. As I cried, the Pope lovingly touched my face to comfort me, an encounter that Thomas and I know only our good and gracious God could plan. Now Thomas and I are happily married. The Lord has set the tone for how He wants us to live and trust fully in his provision. We know He is not stopping with our wedding or honeymoon – His fatherly care is never ending!